Irish or not, four-leaf clovers are ingrained in our culture. They are a symbol of good luck and finding one is quite exciting. When one speaks traditionally about finding a four-leaf clover they are usually referring to a member of the genus Trifolium, which is a genus of true clovers in the legume family. As the generic name suggests, true clovers typically exhibit leaves of three. The odds of finding a four-leaf clover is roughly 1 in 10,000. You stand the best chance of finding them in patches of either white clover (Trifolium repens) or red clover (Trifolium pratense), which are actually native to parts of Europe and Africa. The mutation doesn't stop at four leaves either. 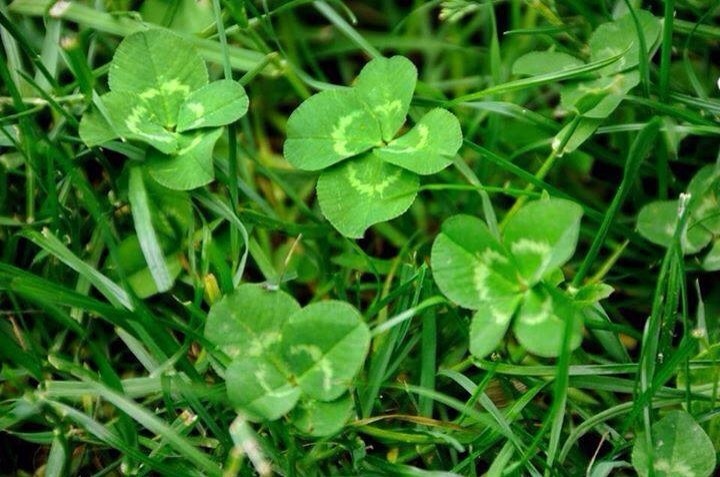 Clovers with five or more leaves have been found and the world record for most leaves on a single clover is 56! What causes this mutation is a bit of a mystery. Some feel that it is environmental while others feel it is the result of recessive genes. A study done on white clover lends some support to the genetic connection. I find it interesting that some of the most the famous depictions of four-leaf "clovers" are not clovers at all but rather varieties of Oxalis tetraphylla. This Mexican species produces leaves divided into four with the characteristic lobe-like shape. Since it only ever produces four leaves, it is a failsafe for those looking to add a bit of "luck" to the season.